Vietnam’s capital, Hanoi offers mystery around every corner. Just wandering through the Old Quarter, you’ll discover hidden temples, fantastic street food, exotic markets, traditional Chinese medicine dispensaries stocked with enigmatic herbs and beautiful French-colonial mansions coloured with the patina of age. Hanoi’s mysteries go far beyond the Old Quarter, but it’s the perfect place to begin your exploration of the city. The Old Quarter is also known as the “36 Old Streets.” Each street was originally named according to the particular craft that it produced. Hang Bac used to produce silver, Bat Su used to sell bowls and Hang Mam Street was named after the pungent nước mắm fish sauce that was made and sold here. Hang Ma is votive paper street; it’s one of the most colourful streets in the Old Quarter, where you can buy everything from brilliant red li xi (“lucky money”) envelopes to paper lanterns and paper effigies of the gods to be burnt during the new moon as offerings to the heavens. Over the years, the street names stayed the same but many of the products changed. However, most of the old streets still have a specialty, selling everything from teas and traditional medicine to bowls and bamboo, tin and toys, jewellery and cloth. Exploring the Old Quarter is a delight for the senses; wherever you go, you’ll find a photograph waiting to be taken. 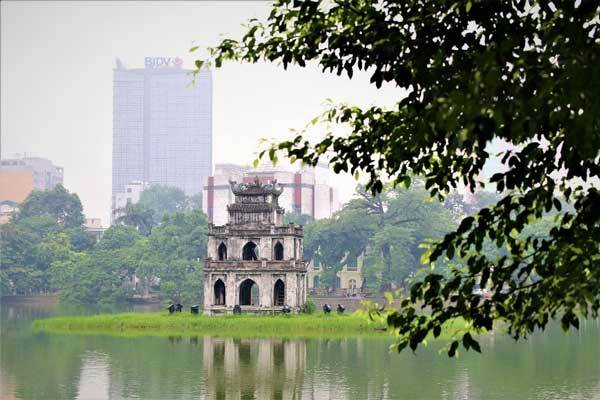 If that sounds like sensory overload to you, it’s only a short walk to Hanoi’s much-loved Hoan Kiem Lake. At the northern end of the lake, a graceful red wooden bridge leads to Ngoc Son temple, the Temple of the Jade Mountain. You’ll see Thap Rua—Turtle Tower—built in 1886, on a small island at the south end of the lake. The entire lake is surrounded by footpaths and comfortable park benches, mature trees and an ever-changing display of flowers. Early in the morning, you can watch joggers make their way around the lake as others practice their t’ai chi. In the afternoon, elders get together and play chess while youngsters enjoy badminton. In the evening, lovers nuzzle and trade promises as the lights of the city shimmer in the quiet waters. The entire area around the lake and many of the streets of the Old Quarter turn into a pedestrian-only zone every weekend. The French Quarter is just south of Hoan Kiem Lake. The Hanoi Opera House, built by the French in 1901, is one of the grandest examples of colonial architecture from this period. It’s worth going to a show there if possible; the inside is as ornate as the exterior. Nearby is the five-star Sofitel Legend Metropole Hanoi. Stop by and explore the lobby, which has several interesting displays about the history of the hotel and a list of some of the more famous diplomats, presidents and celebrities who have stayed there. If you happen to be a guest of the hotel, you can also tour an underground bunker that was in use during the war and just rediscovered during a recent renovation. The Vietnamese Women’s Museum is 700 metres from the Metropole and is one of the finest museums in Vietnam. This thoughtful interactive museum shows the role that Vietnamese women have played in history, the arts and in family life. If you’re interested in learning about the 54 ethnic minorities living in Vietnam or contemplating making a trip to the northern or central highlands to visit some of the hill-tribe villages, the Vietnam Museum of Ethnology is well worth seeing. It is a well-curated museum with many indoor and outdoor exhibits, including full-scale, traditionally built replicas of the distinctive houses and lodges of Vietnam’s major ethnic minorities. Descriptive signage accompanies each exhibit. History buffs may want to visit the Hoa Lo Prison, otherwise known as the “Hanoi Hilton,” the infamous prison where POWs from the war with the U.S. were detained (including the late U.S. Senator John McCain). It’s sobering place that focuses mainly on the period during the French occupation, with a few later exhibits from the American war. The Imperial Citadel of Thang Long was first built in 1010 A.D. and has an impressive massive stone entrance gate. Take the stone pathway past dozens of potted bonsai trees until you reach the royal enclosure. Many of the original buildings have been lost to time, but you can still visit the building and bunker where the North Vietnamese military command was headquartered from 1954 to 1974. You can also visit the nearby Ho Chi Minh Mausoleum and an adjacent museum and stilt house where “Uncle Ho” once lived. The Vietnam Military History Museum is a short walk from the Citadel and recommended for its interesting indoor exhibits that focus primarily on the French and Chinese conflicts over the years, and the outdoor exhibits that include quite a collection of U.S. aircraft captured or shot down during the American War. The Fine Arts Museum, which is across the street from the north end of Hanoi’s oldest university, the Temple of Literature, has a sprawling collection of ancient and modern art. 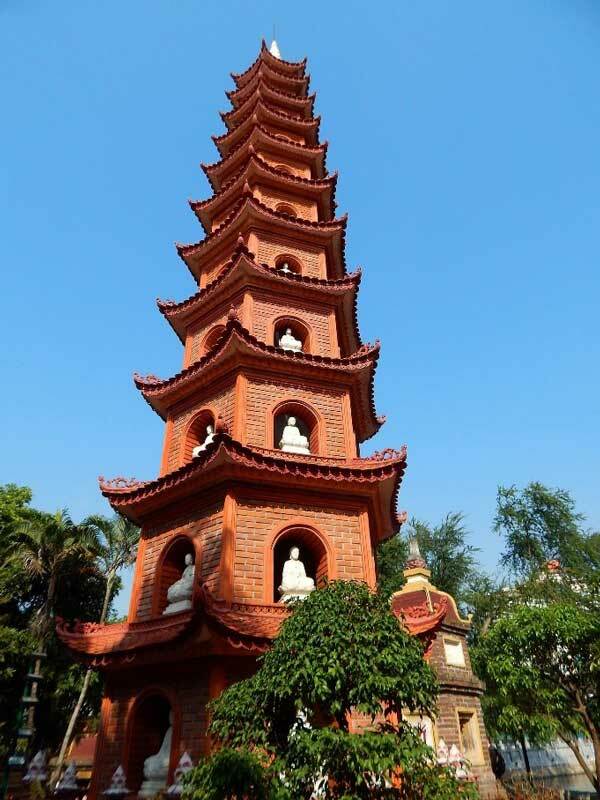 If you have time to visit only one Buddhist temple, see the Tran Quoc Pagoda. It’s on the causeway that separates West Lake from Truc Bach Lake, between the city centre and Tay Ho District. 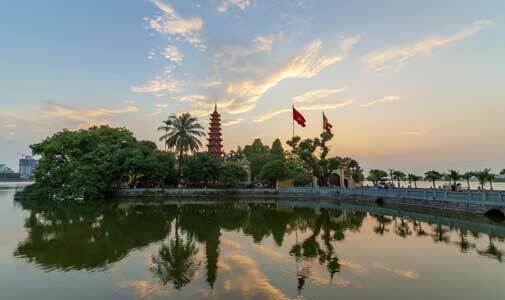 Built in the sixth century, it’s Hanoi’s oldest temple and is still an active place of worship after all these years. The 11-story pink pagoda on the grounds is lovely. West Lake, the largest lake in Hanoi, offers lakeside activities including a water park, seafood restaurants and shopping opportunities. Xuan Dieu Street, on the north side of the lake, is full of good western restaurants, coffee shops, and imported food and clothing stores that cater to Hanoi’s large expat population. Be sure to stop at a bia hơi (literally, “fresh beer”) for lunch or dinner. These are popular open-air restaurants that sell inexpensive draught beer and good Vietnamese food. You’ll find them scattered throughout the city. My favourite is the one at the corner of Bat Su and Hang Vai Street in the Old Quarter.